Spaceflight's "SmallSat Express" Falcon 9 mission lifts off from Vandenberg Air Force Base in California Dec. 3. Credit: SpaceX webcast. WASHINGTON — A SpaceX Falcon 9 exclusively dedicated to small satellites launched Dec. 3, at 1:34 p.m. Eastern, carrying 64 satellites to low Earth orbit. 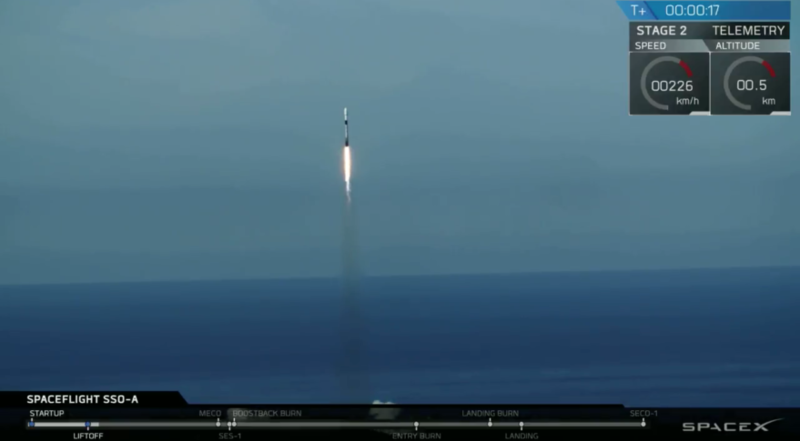 The launch, procured by smallsat rideshare company Spaceflight Industries, was the first time SpaceX reused the same first-stage booster for three missions. The rocket booster previously launched Bangladesh’s Bangabandhu-1 satellite in May and the Merah Putih (formerly Telkom-4) satellite in August for Telkom Indonesia. SpaceX also set a new launch record of 19 missions in one year, besting 2017’s performance of 18 missions. The company’s fairing recovery boat, Mr Steven, tried again to catch the payload fairings as they returned to Earth, but was unsuccessful. Elon Musk, SpaceX’s CEO, said the company plans to reuse them nonetheless. SpaceX did not webcast the deployment of the 64 satellites after the Falcon 9 rocket’s second stage reached orbit, citing an absence of ground stations in view from the rocket to beam down video. Using a stack of payload dispensers split into upper and lower free-fliers, Spaceflight will deploy the satellites over the course of six hours. The launch is the largest single rideshare mission from a U.S.-based launch vehicle — carrying spacecraft for 34 organizations from 17 countries — but is not the first, nor the largest launch of smallsats on a single mission. In February 2017 India’s space agency ISRO launched 104 satellites on a Polar Satellite Launch Vehicle — 88 of them for U.S. company Planet. Six months later a Russian Soyuz rocket launched 73 satellites, though a few of them were unresponsive after launch. Spaceflight’s “SmallSat Express” mission carries a wide range of payloads, from companies well versed in smallsat launch to complete newcomers. Earth observation company Planet launched two SkySat satellites, each about the size of a mini-fridge, on the mission, as well as three Dove cubesats. Several startups booked their first spacecraft on the mission, such as in-space relay company Audacy, radar startup Capella Space, and radio-frequency signal mapper Hawkeye 360. Internet of Things startups Helios Wire and Astrocast launched their first satellites, and Fleet Space Technologies launched its fourth. One atypical payload onboard was Enoch, a cubesat from the Los Angeles County Museum of Art and artist Tavares Strachan that is carrying the ashes of Robert Henry Lawrence Jr., the first African American astronaut selected for a national space program. Lawrence died while training a junior pilot in landing techniques at Edwards Air Force Base in 1967. Strachan created a 24-karat gold canopic jar with a bust of Lawrence that fits inside the cubesat, which is expected to deorbit after seven years. Additional payloads range from the U.S. Air Force’s STPSat-5 spacecraft to Orbital Reflector, a cubesat carrying an inflatable sculpture from the Nevada Museum of Art and artist Trevor Paglen that will remain in orbit, visible from the ground, for several weeks. The SpaceX launch also carries experiments such as PW-Sat2, a student-built satellite from the Warsaw University of Technology in Poland that will test a four-meter deorbit sail. SSTL and Honeywell UK built the VdES Transmitting sAtellite system, or VESTA, to test new two-way maritime information services between ship and shore. British manufacturer SSTL also built KazSTSAT, an Earth observation satellite, with JV Ghalam LLP that has multiple experimental features. Spaceflight has made similar launch purchases since buying the Falcon 9 mission, but for smaller rockets. The company signed a contract in June for most of the launch capacity on three Electron launchers from Rocket Lab, and a forged a memorandum of understanding with Virgin Orbit, also in June, for a LauncherOne mission next year. SpaceX has its next mission scheduled for tomorrow from Cape Canaveral, Florida at 1:38 p.m. Eastern to carry supplies to the International Space Station.